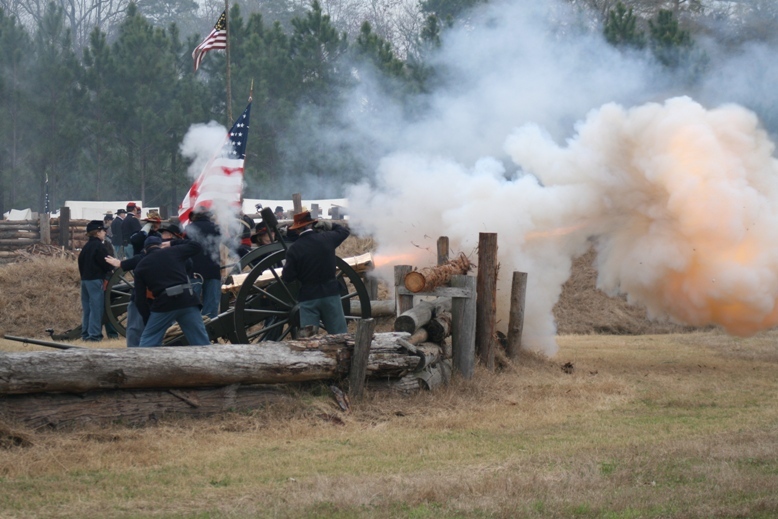 The Battle at Manassas is staged each year the third weekend in March at Fort Wallace-Wood in Tattnall County. Tommy and Elaine Wallace first opened their Tattnall County property in 2000 to Civil War history buffs who bring uniforms and rifles to recreate the life endured by soldiers on both sides. Fort Wallace-Wood is located just off U. S. Highway 280 between Reidsville and Claxton. The entrance to the fort is marked with signs and flags beside the highway. The camp surrounding Fort Wallace Wood opens Saturday and Sunday at 9 a.m. 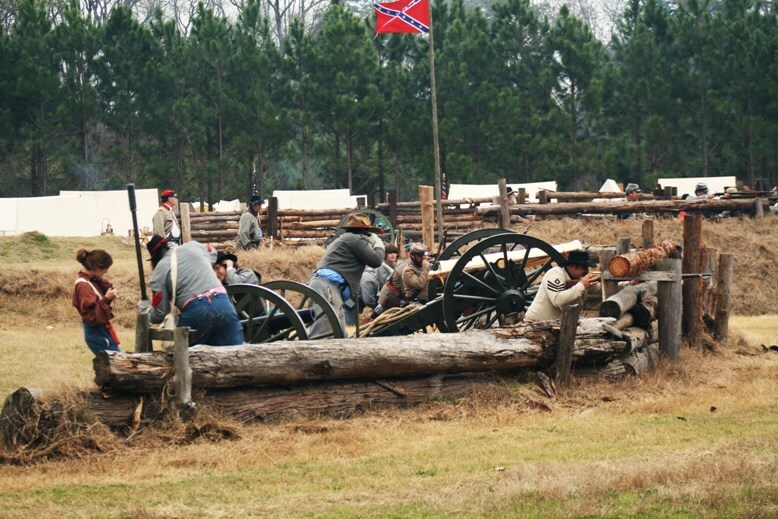 The battle takes place on U.S. Highway 280 between Bellville and Reidsville. Members of the Sons of Confederate Veterans host the Civil War reenactment, recreating the battle of the same name. Visitors can tour the campgrounds to see how soldiers lived, worked and ate. Awards are presented to the Most Authentic Union Soldier and the Most Authentic Confederate Soldier. There is also an artillery competition for the best crew, a mortar competition with live fire on the target and a musket rapid-fire competition. Vendors offer food and a variety of period merchandise and door prizes are awarded to lucky event-goers. The gates open each day at 9 a.m., and activities continue until 5 p.m. on Saturday and until 3 p.m. on Sunday. The Tattnall Invincibles collect the minimal $5 admission fee to help offset costs. Children under 11 are admitted free. Civil War reenacting units are often semi-fraternal organizations with members closely tied to one another by bonds of family, friendship, and a common outlook on their unit's role within the hobby. Within each unit, leaders are elected and afforded titles of military rank, such as sergeant or lieutenant; these ranks then correspond to leadership positions during a battle-reenactment performance. The average participant attends at least one significant weekend reenactment event per month, plus practice drills, unit meetings, or other informal gatherings. The overwhelming majority of Civil War reenactors are males in their late 30s or early 40s, with middle-class incomes and suburban residences. Most Civil War reenactors express conservative political and social views. Some reenactors are also members of the Sons of Confederate Veterans or the Sons of Union Veterans of the Civil War. At the same time, there are increasing numbers of African Americans and women involved in the hobby, in both civilian and soldier roles. The primary motivation for nearly all Civil War reenactors is a general fascination with history and a specific interest in how ordinary soldiers or civilians lived, dressed, and fought. Much of the pleasure of participation lies in trying to physically re-create the camp and battle experience of Civil War soldiers in all but the most dangerous aspects. Reproduction clothing and gear are made to resemble as closely as possible the original items; camp activities, battle formations, and even meals are made to simulate those of the Civil War. Contact Tommy Wallace at 912-557-6649 for questions. Photos on this page courtesy of Skeeter Wiggins.